Our work in supporting street papers to update their business model for the digital age made it to the finals of the European Social Innovation Competition. 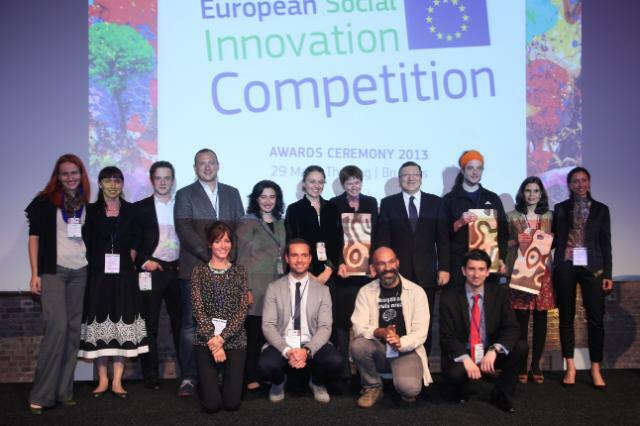 The competition was organised by the European Commission in memory of Diogo Vasconcelos (who was one of the founders of INSP street paper CAIS), with the aim of finding the best social innovation solutions to help people move into work. Our project made it through 605 entries from 30 countries to reach the semi finals. Together with 29 other semi-finalists, we were invited to a 2-day Social Innovation Academy in Amsterdam – organised by Euclid Network, Nesta and KennisLand – to analyze our ideas and develop a business model. Following the academy we submitted revised and detailed project plan and were were selected by the competition jury as one of 10 finalists. Finalists were invited to an awards ceremony in Brussels on 29th May, where 3 winners were presented by President of the European Commission José Manuel Barroso. See pictures, a press release, and a video of the awards ceremony and #diogochallenge on Twitter.